Security Essen runs from Tuesday 27 September to Friday 30 September in Germany. This year, solution manufacturers C-TEC, WAGNER, Apollo, Vanderbilt and Kentec Electronics all have an array of systems to display alongside key messaging for end users, integrators and installers. For its part, C-TEC will be showcasing its life-safety systems. Located for the first time in Hall 3, the action-packed area dedicated to fire detection and live demonstrations, C-TEC’s stand (3E14) is set to feature the company’s new CAST-protocol XFP 1-2 loop addressable fire system, the range of VdS-certified EN54-4 power supplies and its powerful 1-8 loop ZFP touchscreen-controlled addressable fire panels. Also on display will be C-TECs popular BSI-certified conventional sounder isolator system, its new EN54-13 conventional fire alarm system solution and a wealth of other innovations specifically designed for the European market. ‘Visions Become Reality’ is the slogan under which WAGNER will be exhibiting at Security Essen. WAGNER’s stand (Hall 3, Stand 3D44) will feature innovative, future-safe fire prevention solutions, including air sampling smoke detectors, extinguishing technology, fire prevention and fire risk management. WAGNER will be unveiling the TITANUS FUSION, a new all-rounder that combines the successful TITANUS family’s many advantages, such as LOGIC.SENS smoke development patterning and PIPE.GUARD air flow monitoring. The air sampling smoke detector can be used even in dusty environments and is accurate to temperatures as low as -30° C. It can monitor areas up to 3,200 m² in size, and is available in sensitivity levels of 0.5, 0.1 and 0.015 % LT/m. This year, WAGNER is also introducing the TITANUS MULTI SENS, a pioneering system designed for areas where specific deceptive phenomena (such as cigarette smoke, theatrical fog or dust) can trigger false alarms. This new self-teaching air sampling smoke detector can tell the difference between false alarms and real fires. Visitors can experience this innovative, multi-dimensional optical detection system live in fire experiments. WAGNER’s vision of employing nitrogen as an extinguishing agent gave rise to the OxyReduct active fire prevention system. The introduction of this new technology at the end of the 1990s transformed the fire prevention market, as WAGNER began offering OxyReduct active fire prevention rather than reactive extinguishing solutions. Security Essen will be featuring the newest generation of OxyReduct models: the powerful, compact, modular OxyReduct P-Line for larger protection areas and the noise-optimised, compact OxyReduct M-Line for modular nitrogen generation at rates of 10-90 m³/h. Apollo Fire Detectors, a specialist in the design and manufacture of high quality fire detection products, will be showcasing its comprehensive range of products on Stand 3B14 at Security Essen. The new SOTERIA range is the next generation in fire detection technology and is designed to improve detection, reduce false alarms and deliver improved reliability. SOTERIA is the start of an ongoing technology innovation at Apollo. The detectors have been extensively tested by members of the Apollo in-house testing team with facilities that boast some of the most advanced private testing equipment in the UK. Alongside SOTERIA is Apollo’s enhanced protocol named CoreProtocol, the next generation in fire loop communication from Apollo giving greater control and more loop power. The new protocol builds on the established capabilities of XP95 and Discovery; with forward and backwards compatibility and the ability to manage a significantly increased number of devices. As well as the introduction of new products, Apollo will have its new 2016-2017 Product Catalogue available, a crucial guide for anyone who specifies or installs fire detection equipment. The catalogue features all of Apollo’s detection equipment, system components and specialist devices suitable for a wide range of environments. Vanderbilt will attend Security Essen for the first time this year, and will be exhibiting the latest developments across all three of its product ranges: access control, intruder detection and video surveillance. At Security Essen, Vanderbilt will feature Aliro 2 – the latest generation of its access control solution. Building on the success of its predecessor and created alongside external developers, Aliro 2 is suitable for small through to medium-sized commercial applications, boasting easy-to-use Internet-based software and intuitive mobile features. Using the advanced Mercury firmware platform, it supports – as standard – 64 doors and 5,000 users. With additional software licenses, the system can be increased up to 1,024 wired doors, 1,024 wireless doors and 25,000 users. Integration with Aperio is one of the highlights in the new feature set of Aliro 2, but there’s “much more to come” as this new system paves the way for Vanderbilt’s future migration strategy. Vanderbilt’s SPC intrusion panel will also be featured on the stand. Vanderbilt continues to develop attractive features for this range, including its SPC Connect. This cloud-based innovation provides customers with remote access to control panels, safe in the knowledge that the process is highly secure thanks to the implementation of financial grade SSL security. New to the video portfolio is the Eventys range, a cost-effective range of cameras and recorders that are aimed at the simple set-up and plug-and-play approach. With an intuitive interface offering “outstanding functionality” and flexibility, Eventys is perfect for small to medium-sized installations that require up to 20 cameras. Visitors to Stand 1A03 in Hall 1 Security Essen will be able to see some of the latest fire safety products from Kentec Electronics. Its extensive range of EN, UL and FM, marine, analogue, conventional and extinguishant fire control panel solutions are the first choice for many safety critical, prestigious locations across the world. Kentec will be exhibiting its Syncro and Sigma ranges designed for the widest, most demanding range of applications. The Sigma XT range includes status units, Sigma XT+, the Sigma XT ECU hybrid solution and Syncro AS, plus its comprehensive range of UL-listed, FM-approved Elite RS analogue addressable fire control panels, Sigma A-XT releasing panel and status units and the UL-listed Sigma A-CP annunciator panel. Show visitors will be able to see live demonstrations of the company’s all-new Taktis range of fire alarm control equipment, which combines the very latest hardware and software to produce a powerful and sophisticated control and indication system that’s both simple to use and understand. The flexibility of the Taktis platform means that it can be reconfigured to realise many other control and indication applications, with direct integration into intelligent buildings a reality for end users. Vanderbilt, the state-of-the-art security systems developer, has had its commitment to Best in Class quality management highlighted by achieving the prestigious ISO 9001 certification. This latest accolade is part of the company’s ongoing efforts to make its processes as agile as possible and set the standard in what’s now an increasingly competitive market. ISO is the world’s largest developer of voluntary international standards that acknowledge industry Best Practice. Since it was first published in 1987, ISO 9001 has become the world’s most established quality management framework and is currently used by over a million companies across the globe. The standard is based on a number of principles including a company’s commitment to excellence and its stakeholders, and a willingness to work towards continually improving efficiencies. Having completed the successful acquisition of Security Products from Siemens in 2015, Vanderbilt’s ISO 9001 certification maintains the level of quality that its customers expect and allows the business to enhance customer satisfaction and improve customer loyalty, leading to repeat business. These processes will also help the organisation gain market share through flexible and fast responses to market opportunities. Vanderbilt’s quality management system was externally certified through Intertek, a multinational certification body that has helped companies around the world improve performance and become more efficient for over 130 years. The hard work is all set to continue, as Vanderbilt looks to meet the requirements of ISO 9001:2015, the latest revision of the standard. 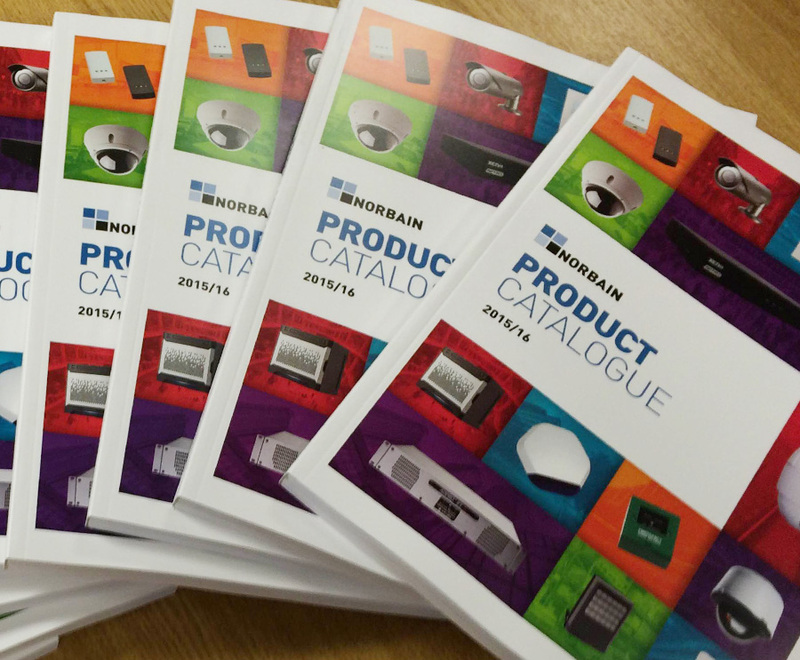 Norbain – the distributor of IP, CCTV, access control and intruder detection solutions – has announced that its new Product Catalogue is now available. As always, the document includes products from the leading brands in the industry, as well solutions from more specialist companies. Following on from the success of the 2014 catalogue, the 2015-2016 edition incorporates the use of detailed product comparison tables which allow the user to simply and quickly compare products in the same category. As part of Norbain’s dedication to continually providing customers with “the best solutions” on the market, this year’s catalogue contains a number of new suppliers, among them 2N, Agent Vi, Bentley Security Projects, Digital Barriers, Entertech (Suprema), Razberi and a new server range called IP Safe. These new suppliers are joined by industry-renowned brands such as Axis Communications, Samsung, Paxton, Pelco, Bosch Security Systems, Milestone Systems and Vanderbilt. As always, this ensures that customers continue to benefit from the widest range of products.